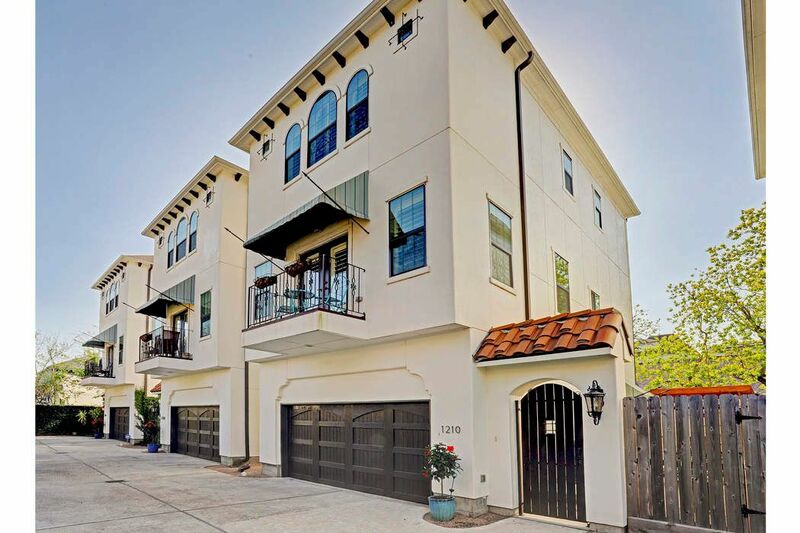 1210 West 24th Street, Houston, TX 77008 | Martha Turner Sotheby's International Realty, Inc.
CHARMING TUSCAN VILLA-INSPIRED HOME ON W. 24TH STREET IN THE HEIGHTS. PRIVATE SIDE ENTRANCE, AWNINGS, BALCONY AND WIDE DRIVE FOR EASY ACCESS. NOTICE THE KORBELS AT THE ROOF LINE AND THE ARCHED WINDOWS ABOVE. ARCHITECTURALLY STUNNING! SIDE ENTRY TO MAIN ENTRY DOOR HAS WOOD DECKING, SCONCES, AWNING AND TUSCAN STYLE DOOR WITH SPEAK-EASY GRILL. JUST IMAGINE WELCOMING YOUR GUESTS HERE! SPACIOUS FLOYER HAS TRAVERTINE TILE AND WOOD TREAD STAIRS. A WARM AND INVITING GREETING SPACE. 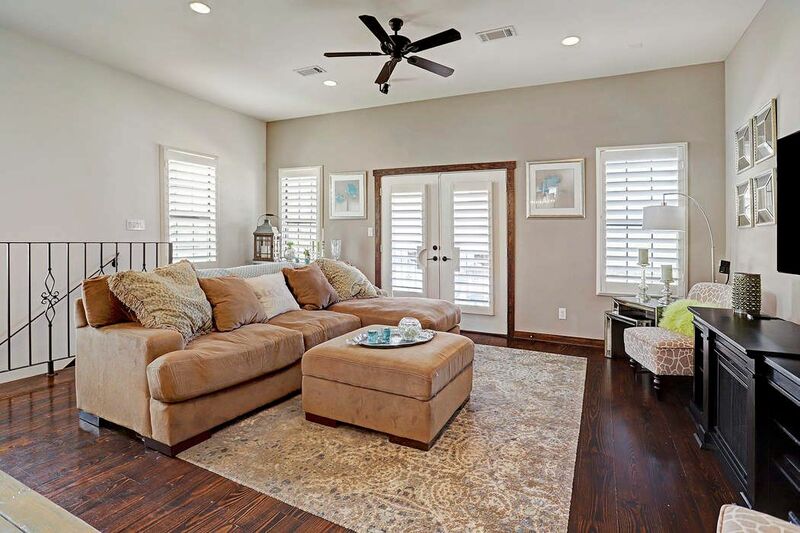 OPEN CONCEPT LIVING AREA BOASTS BEAUTIFUL WIDE PLANK WOOD FLOORS, NATURAL LIGHT, PLANTATION SHUTTERS, CEILING FAN AND DOUBLE DOORS TO BALCONY WITH AWNING. NOTICE THE UNIQUE WROUGHT IRON RAILING OVER THE STAIRWAY. THIS VIEW OF THE LIVING AREA SHOWS ONE OF THE TWO THE MOUNTED SPEAKERS THAT CONVEY WITH THE HOME. A LOVELY PLACE TO RELAX OR ENTERTAIN. THE DINING AREA HAS UNIQUE IRON CHANDELIER AND OPEN SPACE FOR DINNER PARTIES. THIS VIEW SHOWS THE OPEN CONCEPT OF THE SECOND FLOOR. OH WHAT A TERRIFIC VIEW TO THE KITCHEN! THE ARCHED TRANSITION PROVIDES DELINEATION WITH AN OPEN FEEL. THE KITCHEN CEILING IS TILED! YOU TYPICALLY ONLY SEE THIS IN MILLION DOLLAR HOMES. 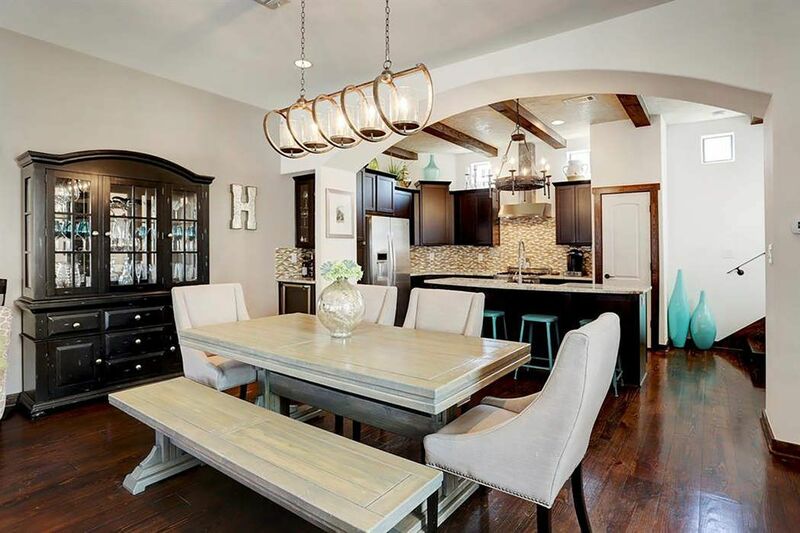 WOOD BEAMS, TILE BACKSPLASH, STAINLESS STEEL APPLIANCES (REFRIGERATOR CONVEYS), GRANITE WITH GREAT MOVEMENT AND STUNNING CHANDELIER MAKE THIS KITCHEN PRICELESS! 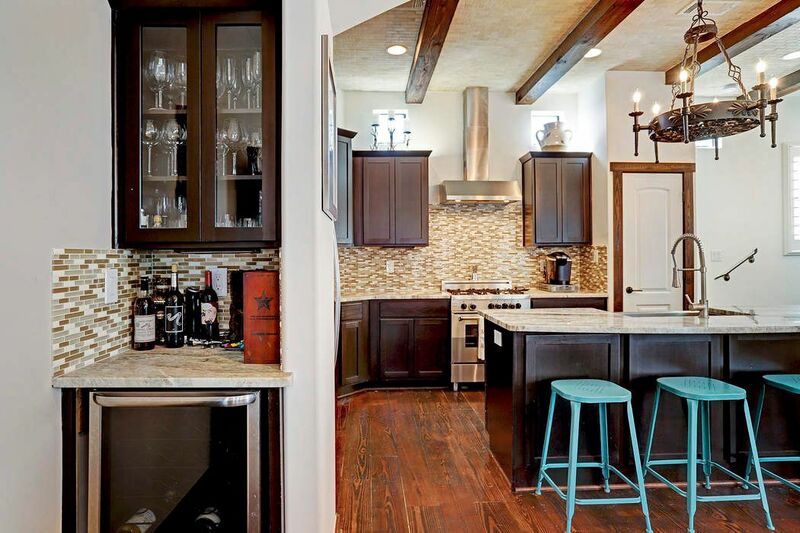 WINE REFRIGERATOR AND BAR STORAGE IS TUCKED AWAY BETWEEN THE DINING AREA AND KITCHEN. NOTICE THE UPPER WINDOWS THAT PROVIDE LOADS OF NATURAL LIGHT. 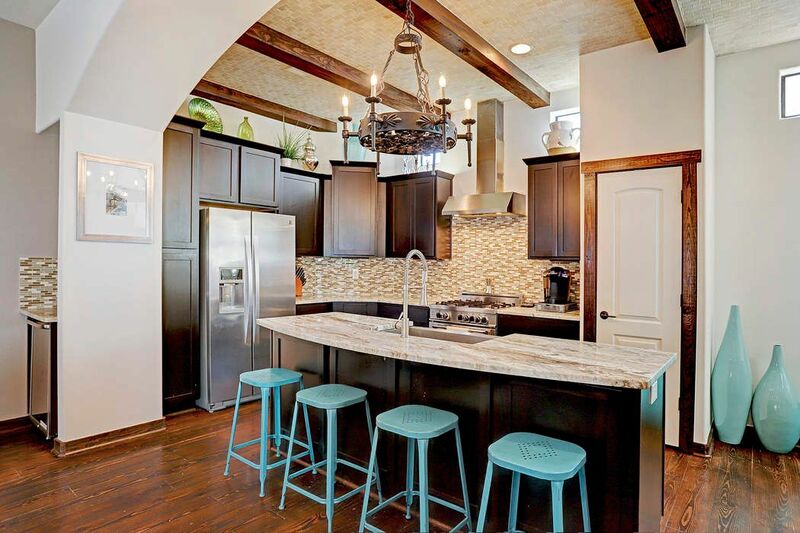 INDUSTRIAL VENT HOOD LENDS A SLEEK LOOK. YES, THAT IS AN ITALIAN BERTAZONNI GAS RANGE! THE STAINLESS STEEL APRON FRONT SINK AND INDUSTRIAL STYLE FAUCET MAKE FOR A SLEEK, CONTEMPORARY LOOK. NOTICE THE MOVEMENT OF THE GRANITE! JUST EXQUISITE. 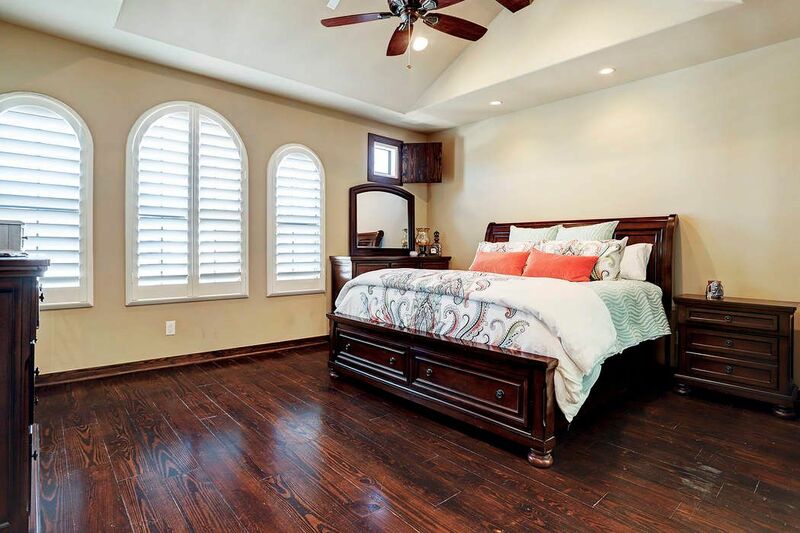 MASTER BEDROOM HAS WIDE-PLANK WOOD FLOORS, ARCHED WINDOWS WITH PLANTATION SHUTTERS, CEILING FAN AND CATHEDRAL CEILING. NOTICE THE SMALL UPPER WINDOW WITH DOOR. 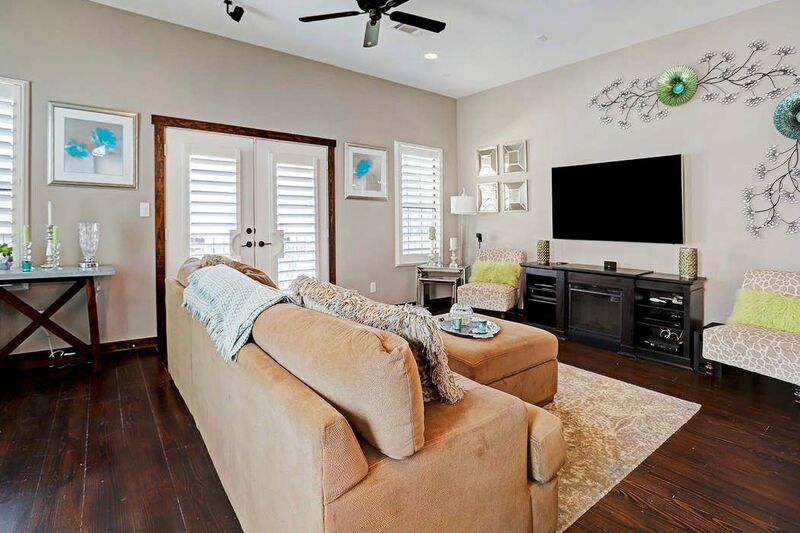 THERE ARE SO MANY TOUCHES TO THIS HOME THAT GIVE IT A CUSTOM FEEL. THE MASTER BEDROOM HAS INDEPENDENTLY OPERATED OVERHEAD LIGHTS FOR NIGHT READING. 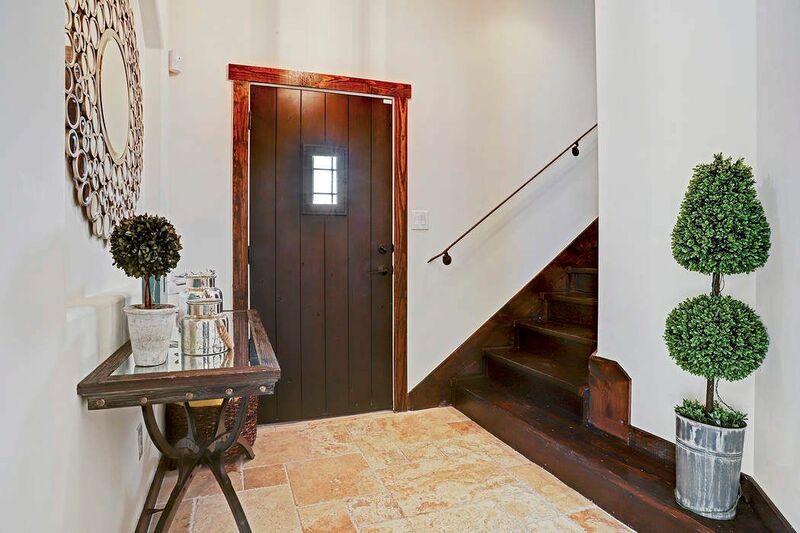 THE BARN DOOR TO THE MASTER BATH ADDS CHARACTER AND ON-TREND STYLE. NOT SHOWN IS THE GENEROUSLY-SIZED MASTER CLOSET WITH A WINDOW FOR NATURAL LIGHT. 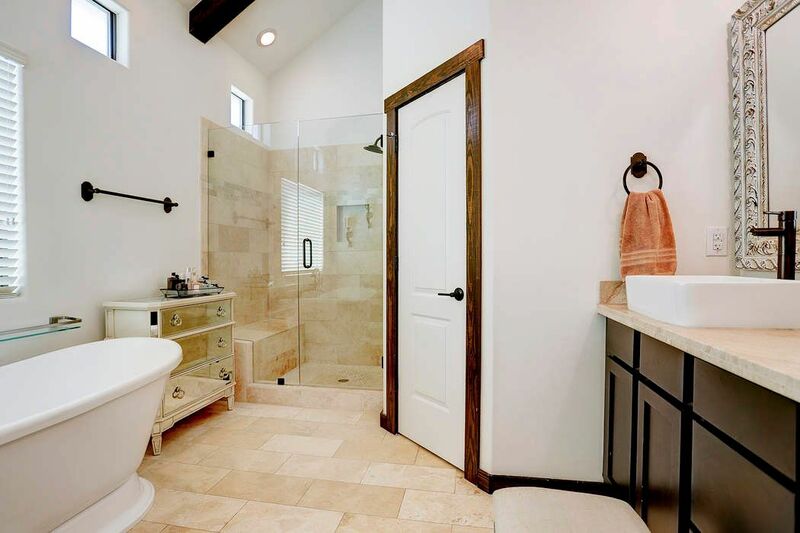 SPA-INSPIRED MASTER BATH WITH TRAVERTINE SHOWER WITH SEAT AND FLOORS ALSO HAS SOAKING TUB, WOOD BEAMS, WINDOWS FOR NATURAL LIGHT AND A CEILING FAN. DUAL VANITIES HAVE VESSELS SINKS, SCONCE LIGHTING AND LARGE FRAMED MIRROR. 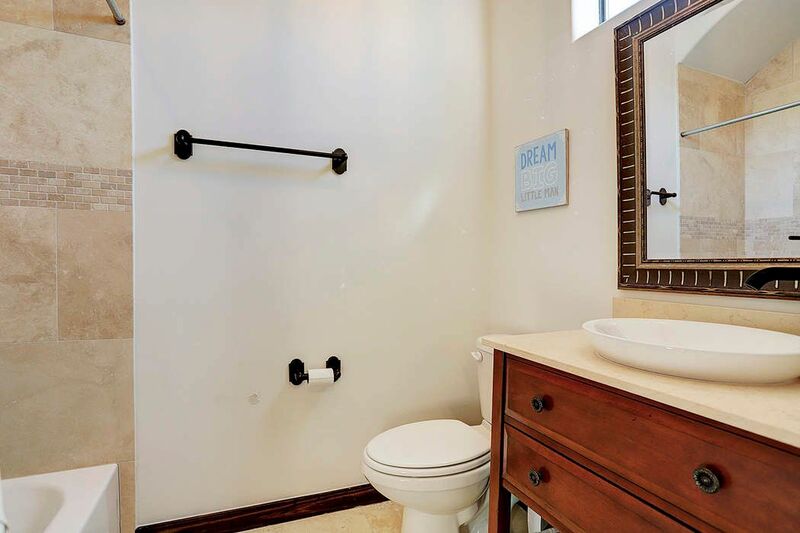 DOOR LEADS TO A PRIVATE WATER CLOSET. THIRD FLOOR BEDROOM HAS WIDE-PLANK WOOD FLOORS, CEILING FAN, LOADS OF NATURAL LIGHT, WALK-IN CLOSET AND EN SUITE BATH. THIS IS THE EN SUITE BATH FOR THE THIRD FLOOR BEDROOM. 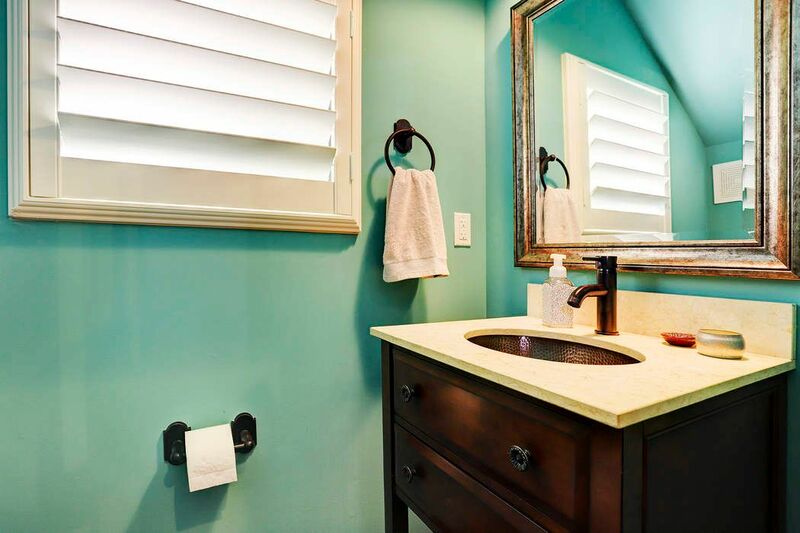 THE CABINET-STYLE VANITY HAS VESSEL SINK AND FRAMED MIRROR WITH UPPER WINDOW FOR NATURAL LIGHT. THIS BATH HAS A TUB/SHOWER COMBINATION. 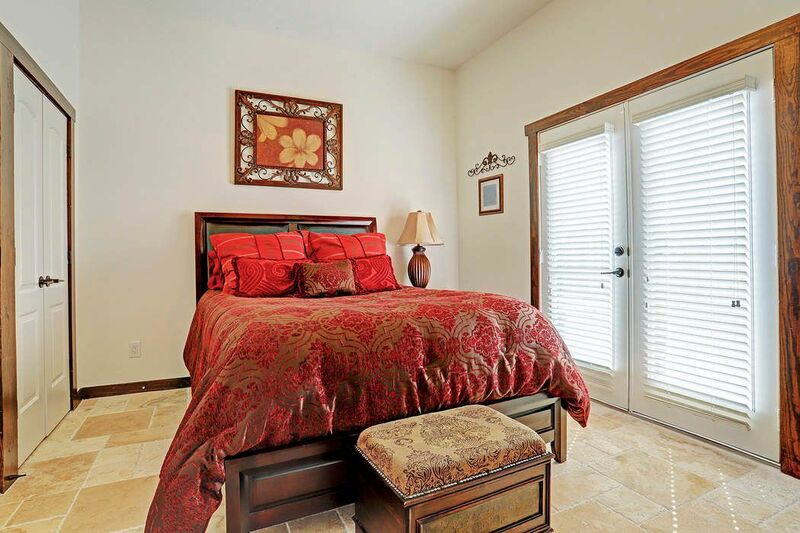 DOWNSTAIRS BEDROOM HAS OFFSET TRAVERTINE TILE FLOORING, CEILING FAN, DOUBLE-DOOR CLOSET AND FRENCH DOORS (WITH BLINDS) TO THE BACK OUTDOOR AREA. EN SUITE BATH FOR FIRST FLOOR BEDROOM HAS CABINET-STYLE VANITY WITH VESSEL SINK AND DECORATIVELY FRAMED MIRROR. THIS BATH HAS A TRAVERTINE TILED SHOWER. 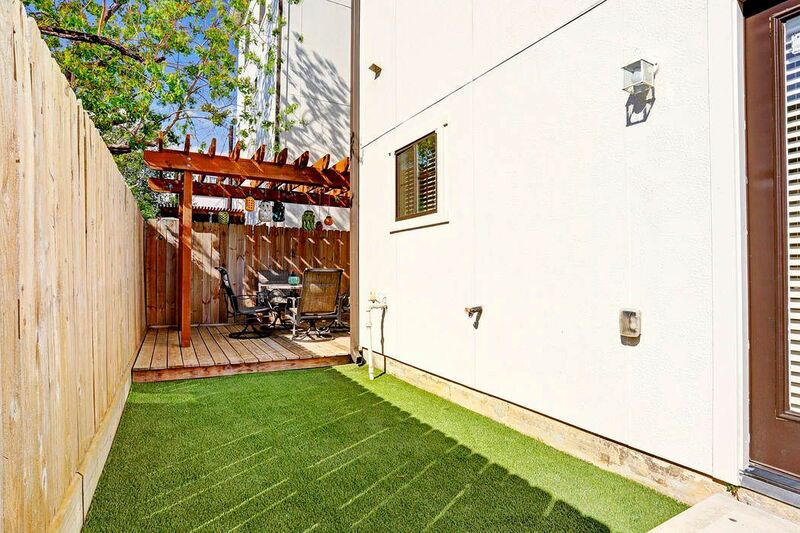 THE BACK OF THE HOME HAS TURF FOR AN EVERGREEN LOOK. SEE THE PERGOLA IN THE FOREGROUND. 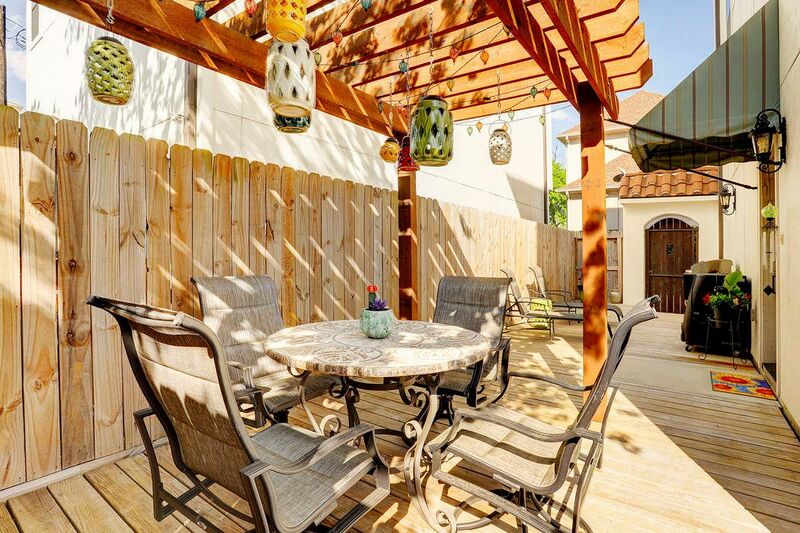 CAN YOU IMAGINE ENTERTAINING UNDER THIS BEAUTIFUL PERGOLA? 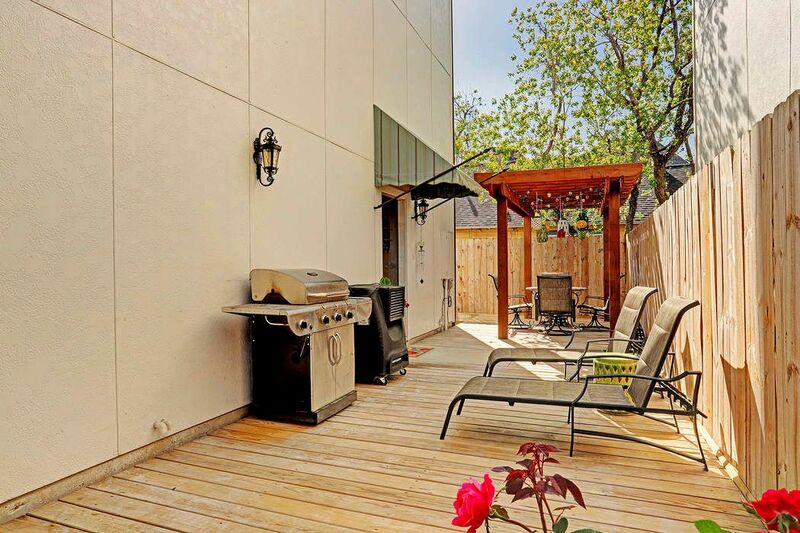 IT IS RARE TO GET THIS KIND OF OUTDOOR SPACE IN THE SHADY ACRES AREA OF THE HEIGHTS. ENJOY THE OUTDOORS OF THIS LOVELY TUSCAN VILLA-INSPIRED PROPERTY! WELCOME HOME TO 1210 W. 24TH STREET! 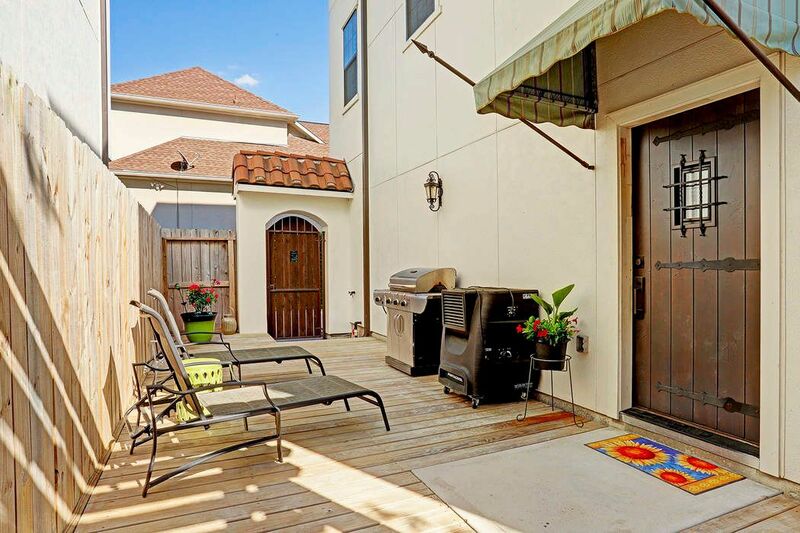 $399,000 3 Bedrooms3 Full / 1 Partial Baths1,938 sq. ft. 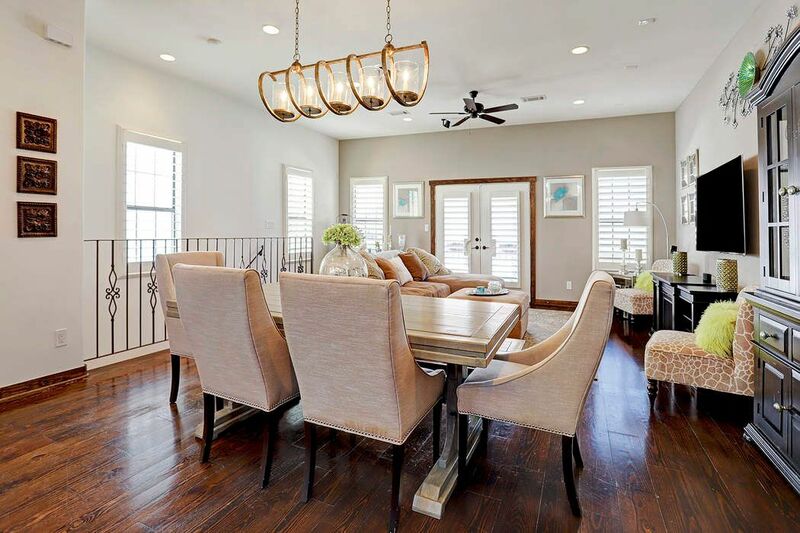 Elegant Tuscan villa-style home with classic detailing, natural light and extraordinary finishes. 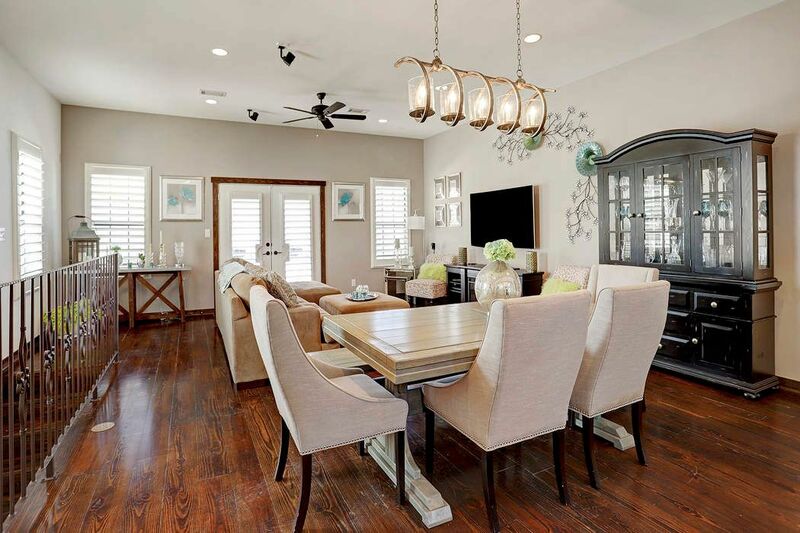 Solid wood floors, tall ceilings, plantation shutters and open concept living. 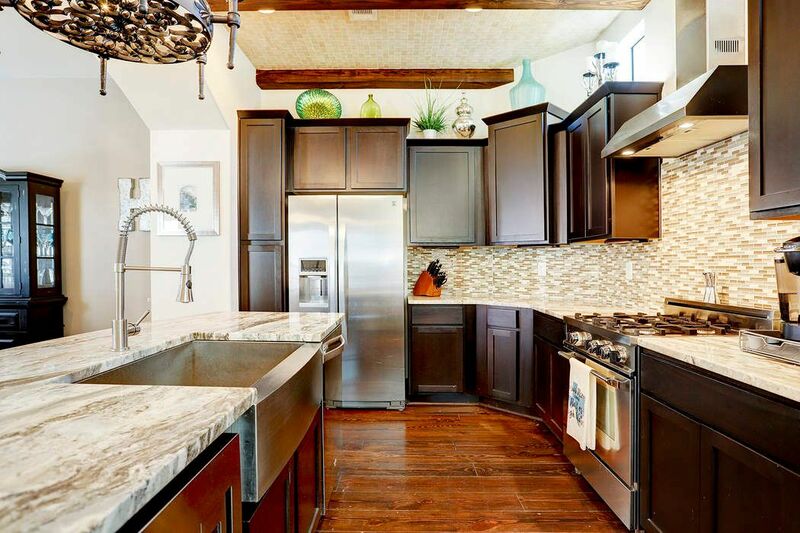 You’ll appreciate the wood beams, custom lighting, wrought-iron detailing and gourmet kitchen with Bertazzoni range, industrial vent hood, stainless apron-front sink and wine refrigerator. 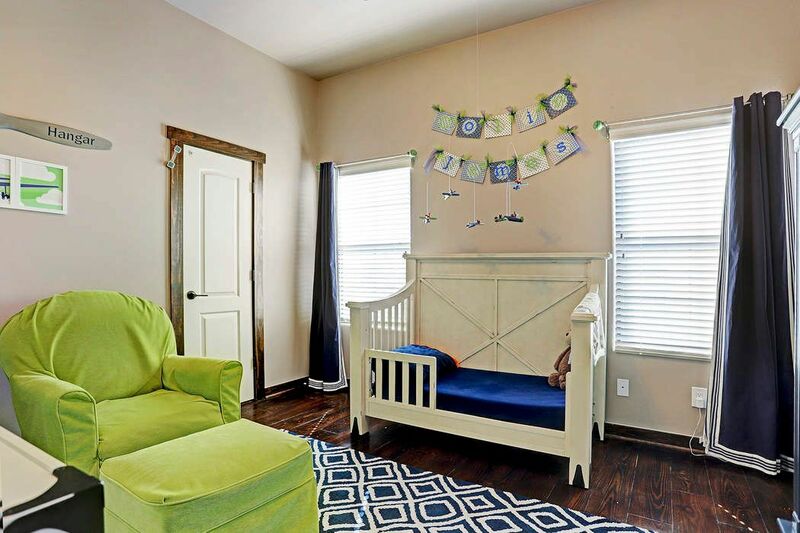 Spacious master suite boast cathedral ceilings, wood beams, barn door and hardwood flooring. 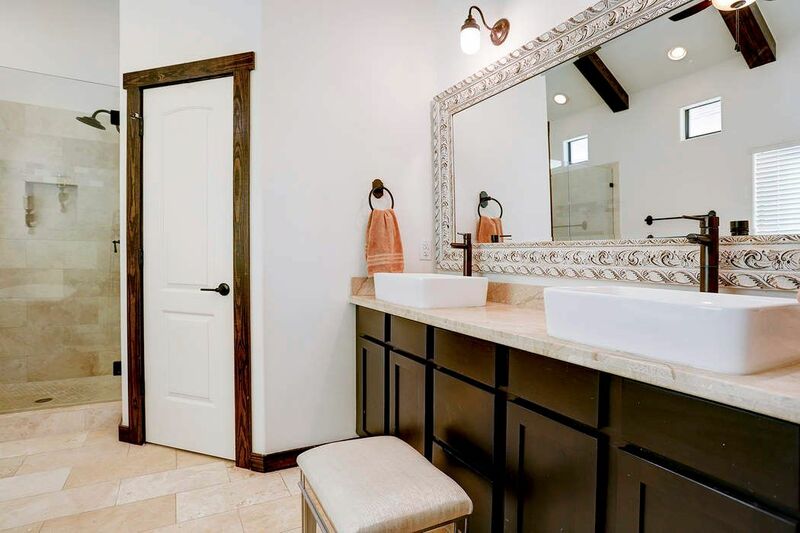 Travertine tiled master bath with wood beams, vessel sinks, separate soaking tub and shower and ceiling fan make for a serene retreat in which to start or end your day. 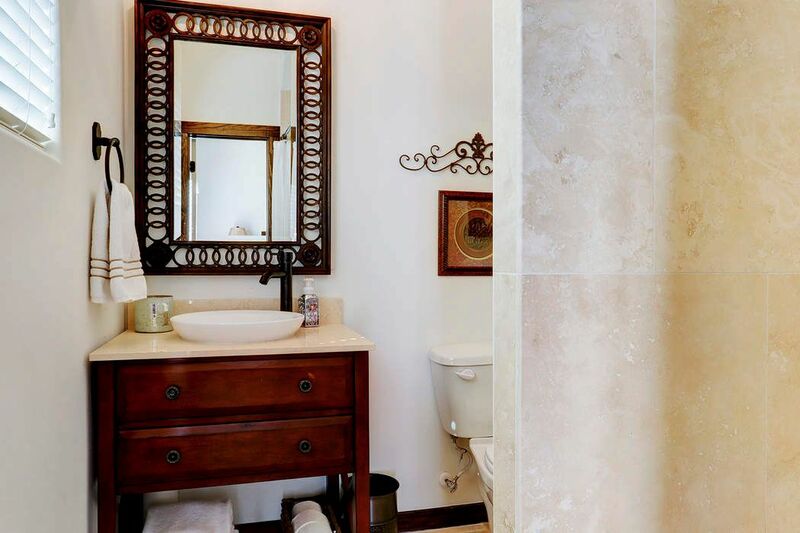 Downstairs guest suite boasts travertine tile floors, en suite bath and double doors to the side yard. Outdoors is decked with pergola for entertaining and turf grass for an evergreen look. 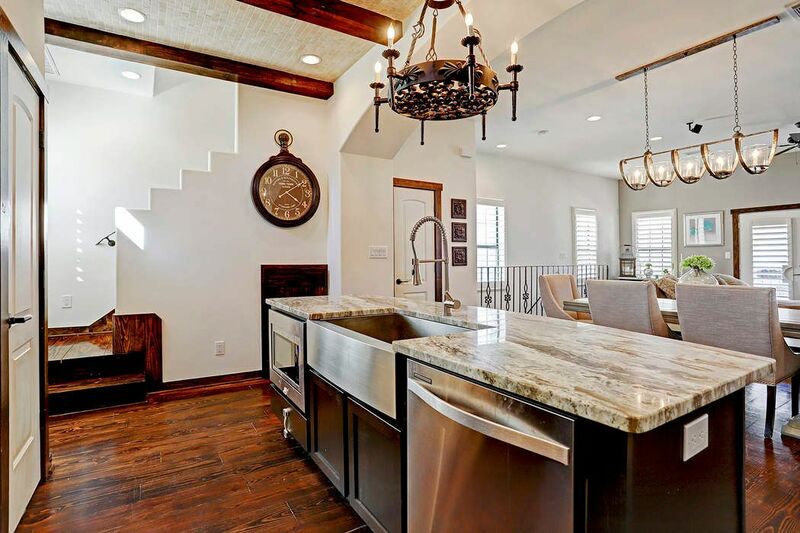 Nothing was left untouched in this quality construction home down to the speakeasy door, tiled ceiling in the kitchen, custom awnings and private entry. True quality in the Heights.